Core Employee Needs: Not All or Nothing! It seems as though we are consistently seeing data that show decreasing levels of employee engagement and feelings of fulfillment at work. This data can be, and has been, attributed to many factors, such as a lean post-recession workforce, an increasingly competitive talent landscape, and the uber-connected, uber-informed and uber-on business world in which we operate. I’d agree that all of these can create barriers to an engaged workforce, or challenge an already highly engaged workforce. There’s also data indicating (as I discussed in my post on what Millennials look for in a great workplace) that high amounts of stress, feelings of low-engagement or no work/life balance are not as significant as we may think. There are, on a positive note, data that suggest workplaces are doing much to negate issues of engagement and work/life balance, but much of this research comes from companies classified as “Best Workplaces” and considering the frequency of content reporting low levels of engagement, trust, and happiness, such companies may be few and far between. Ultimately, we can only take data at face value. The real importance of looking at such workplace statistics is to inform ourselves and build our “bigger picture” – know what’s out there, know what’s conflicting, and create solutions and approaches that are right for our own people, culture and strategic goals. Some data I recently found interesting comes from an article published in The New York Times, “Why You Hate Work” which included research from The Energy Project, an organization that aims to increase employee engagement and sustainable performance for organizations and their leaders. The article, by The Energy Company’s CEO Tony Schwartz and consultant Christine Porath, discusses how “the way we’re working isn’t working” and that it’s increasing common for both middle managers and top executives to feel overwhelmed and disengaged. In an effort to understand what’s impacting people’s engagement and productivity at work, The Energy Project partnered with The Harvard Business Review to survey 12,000 + mostly white-collar employees across a range of industries and organizations. They found that employees are considerably more productive and engaged when they have the opportunity to: regularly renew and recharge at work, feel valued and appreciated for their contributions, focus in an absorbed way on their most important tasks, define when and where they get their work done, do more of what they do best and enjoy most, as well as feeling connected to a higher purpose at work. The study attributed these four areas to four core needs: physical, emotional, mental, and spiritual. In terms of the core physical need at work, The Energy Project’s study determined that employees who take breaks every 90 minutes find themselves with a 30 percent higher level of focus than those who take one or no breaks during the day. These employees also report a 50% greater capacity to think creatively and a 46% higher level of health and well-being. Also interesting, is that when employees feel encouraged by their supervisor to take breaks, their likelihood to stay with any given company increases by nearly 100%. For the core emotional need, feeling cared for by one’s supervisor has the biggest impact. Employees who noted having more supportive supervisors were 67% more engaged. The core mental need? Respondents that were able to focus on one task at a time reported being 50% more engaged (although only 20% of respondents reported being able to do this). Comparably, just 1/3 of respondents reported being able to effectively prioritize their tasks, but those who did were 1.6 times better able to focus on one thing at a time. In regards to the core spiritual need, the Energy Project’s research found that employees who derive meaning and significance from their work reported 1.7 times higher job satisfaction and were 1.4 times more engaged at work. 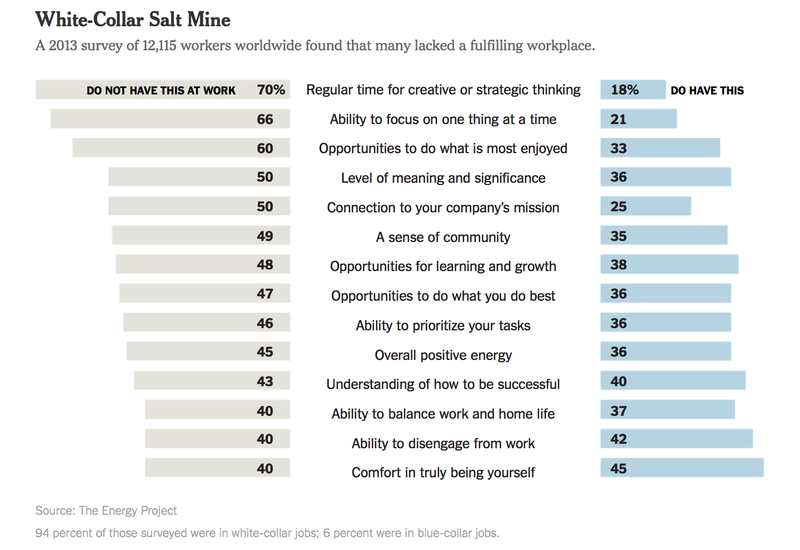 In a nutshell, this data show that how employees feel at work has a huge impact on their engagement and productivity. One last valuable nugget of data to note from this study is that when employees have even just one of the core needs discussed above met, versus none, all variables of their performance improve (from engagement, to loyalty, job satisfaction, positive energy at work, and lower perceived levels of stress). This is good incentive for organizations to work on things one step at a time. It clearly isn’t an all or nothing proposition. Positive changes in employee engagement don’t necessarily happen from massive culture changes or vast implementation of new programs. Baby steps are okay folks; and the more core needs are met, the more positive the impact! I’ve referenced several times the good work that Georgetown University’s Center on Education and the Workforce is doing in predicting the educational preparedness (or lack thereof) of the workforce in relation to the anticipated jobs growth in the United States. Anthony P. Carnevale and his colleagues have just published Recovery: Job Growth and Education Requirements Through 2020. This is a follow up to their 2010 publication, Help Wanted: Projection of Jobs and Education Requirements Through 2018. The bad news is that the educational preparedness of the U.S. workforce is getting worse as we look to the future. Without systemic changes to the U.S. post-secondary education system, the economy will now fall 5 million workers short with post-secondary degrees by 2020 – an increase of 2 million from their projection of a 3 million shortfall in 2018. While many sources are predicting that the U.S. economy will create 55 million new job openings over the next decade, these new job openings are a combination of an anticipated 24 million newly created jobs and 31 million openings created by Baby Boomer retirements. Foundational to the calculations are that jobs are returning much more slowly that we thought they would following the recession. Still, an increase of 24 million new jobs between now and 2020 seems hugely optimistic. That’s an average of 307,000 new jobs per month between now and 2020. When has the U.S. sustained that kind of consistent job growth? Well, according to Bureau of Labor Statistics, in the last 30 years, only 1994 averaged new jobs creation at a rate of over 300,000 per month. 1994. A long time ago. The implications here are clear regardless of the numbers of new jobs created: employers and others predict that soon nearly two-thirds of all jobs will require some kind of post-secondary education or training. In 1973 – just 40 years ago – less than one-third of all jobs required the same. Forty years isn’t a very long time – just one generation. Lots of change in the nature of jobs, work, education, skills and employability in 40 years. The report also defines the skills that will be most valued and in demand for the new jobs landscape. These are not as revolutionary as one might think. Cognitive skills of leadership, communication, analytics and administration will be most valued and in demand. Take a look and see what you think. The Center on Education and the Workforce generates useful information for those involved with education and/or workforce planning – functions that should joined at the hip today and in the future.